Tuesday, April 04, 2017, 7:00 – 9:00 p.m. Please join us for these brief presentations followed by discussion. Over the last 3 months, the storefront adjacent to Access’ gallery space at 222 East Georgia has hosted bi-weekly open discussion sessions informed by invited artists, writers, curators, and activists. Adding to this exciting program, we have launched an artist-in-residence series to provide space and time to artists interested in addressing questions of the foreshore. 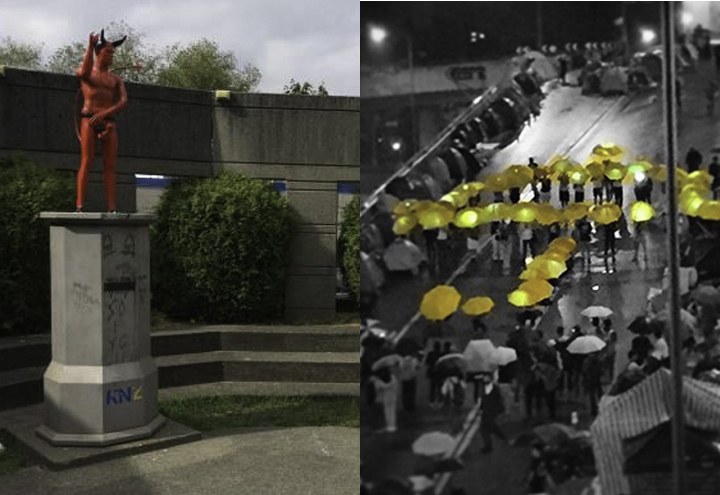 Image credits: Left: Jeremy Hunka, Global News, Vancouver BC, 2014; Right: “Yellow Umbrella Man Group – Part 2”, K of Hong Kong Thru My Eyes, 7 November 2014.